Celebrating a holiday can be challenging for those with diabetes, as sweet treats are a part of many holiday celebrations. Come Valentine’s Day, chocolates, candy and rich desserts can often be found on the menu, which can prove problematic for those who have to watch their blood-glucose levels. 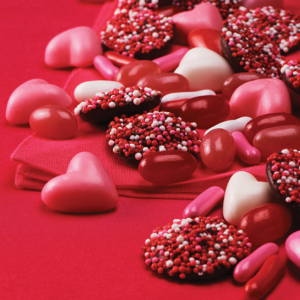 Diabetics may be tempted to indulge in too many sugary foods on Valentine’s Day. Fortunately individuals do not have to put their health in jeopardy in the name of Valentine’s Day, as there are many healthy ways to celebrate with some minor tweaks. • Focus on fun, not food. Rather than making food the focus of the day, shift your attention to all the fun things you can do with your valentine. Fill the day with activities such as ice skating or sightseeing. Even though the weather may be cold, it’s possible to enjoy the great outdoors. Dress appropriately and enjoy a walk in the park, or do something out of the ordinary, like sledding. If you must retreat indoors, watch a romantic movie. • Plan ahead when changing your diet. It’s often possible to work small amounts of a particular dessert or food into your normal meal plan by adjusting what you eat for the rest of the day. If you plan ahead for a bite of chocolate, you can balance out sugar levels by eliminating something else. Keep tabs on your sugar levels throughout the day, and always weigh the benefits and drawbacks of the foods you eat. • Include smart substitutions. Many favorite foods are available in low-sugar or sugarless varieties that are diabetic-friendly. Lean toward low-carb offerings and foods that are relatively low in fat. Baking your own treats or cooking your own meals will give you greater control over the ingredients used in your recipes, and that can pay big dividends in terms of health. • Send nonfood items into the classroom. Diabetes affects people of all ages. When sending valentines into the class for children, do not accompany the cards with chocolate kisses or other candies. Instead, choose toys or keepsakes, such as heart-shaped erasers or scented stickers. Moderation is key when managing diabetes around Valentine’s Day. Place a greater emphasis on time spent together, entertainment and socialization rather than potentially unhealthy treats.